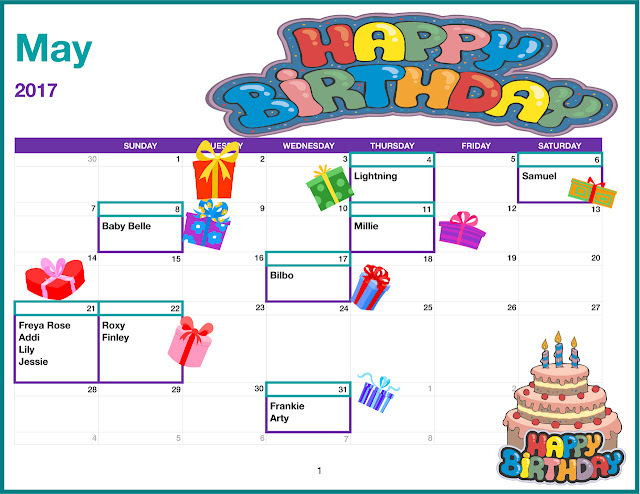 Just look at all the amazing May Birthdays in Blogville!!! Join us in wishing all them all a very Happy Birthday Month!! 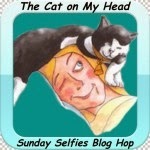 Arty here today to wrap up my Tylee's 30 Day Challenge! 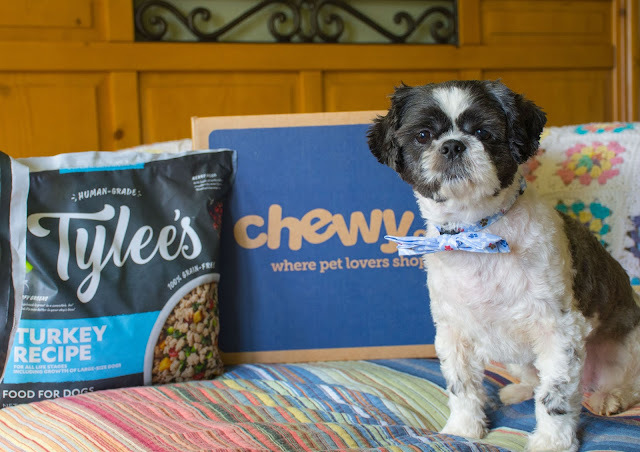 I reaaallllllly enjoyed this food, and Mama loves that it is made with human grade food! 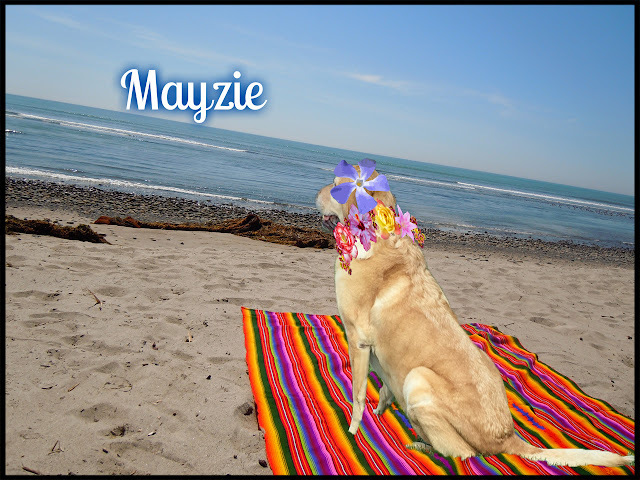 She also says my coat is a bit thicker and not as dry as it was before we tried this food! 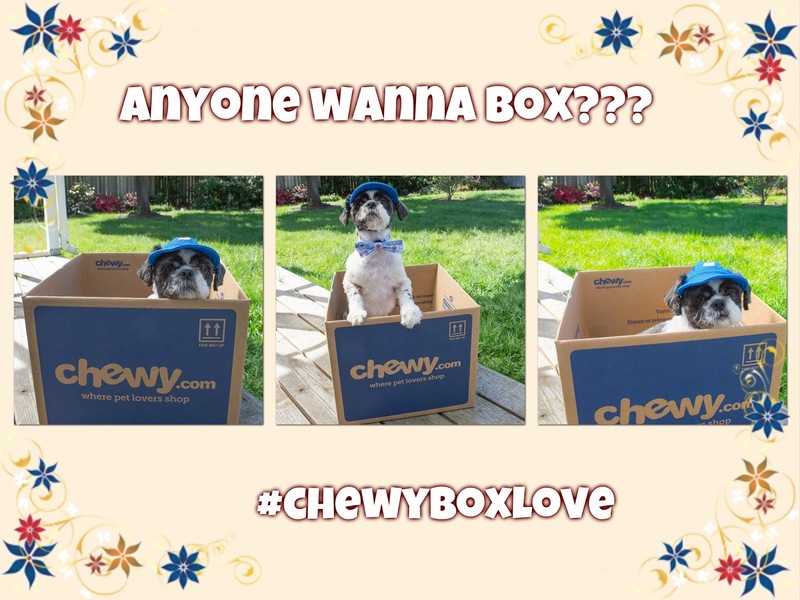 I would definitely recommend this as a topper for medium to big dogs and even as a day to day food for pups my size and smaller! 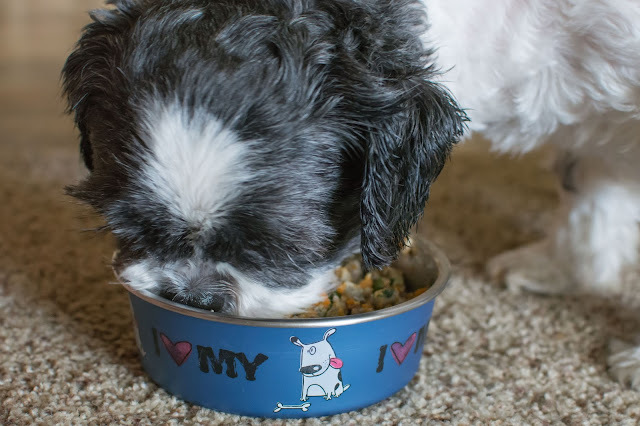 That being said, Jakey doesn't like anything but plain ole kibble so Mama says we may buy this again for topper for my foodies, but it didn't make enough of a difference helping my itchies for us to order it regularly. 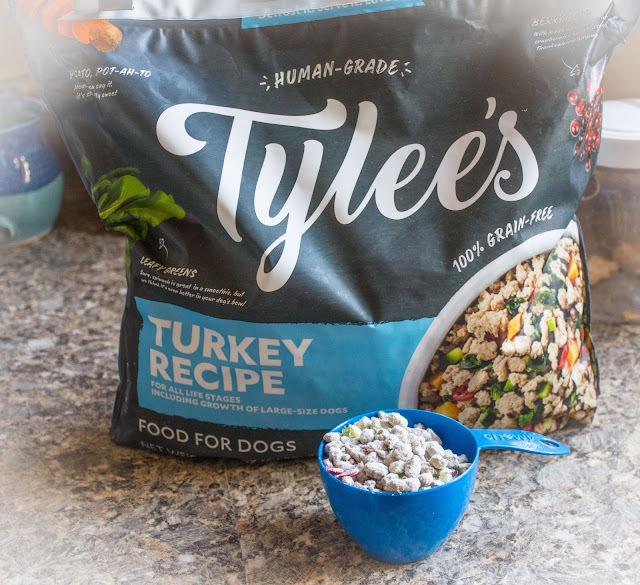 We love being a #chewyinfluencer and appreciate Natalie giving me a chance to review Tylee's Turkey Recipe!! 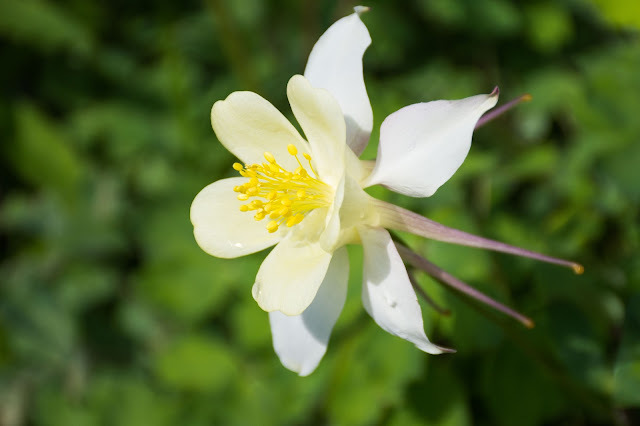 Mama here this week too talk about the change in seasons...along with some changes coming to our blog. 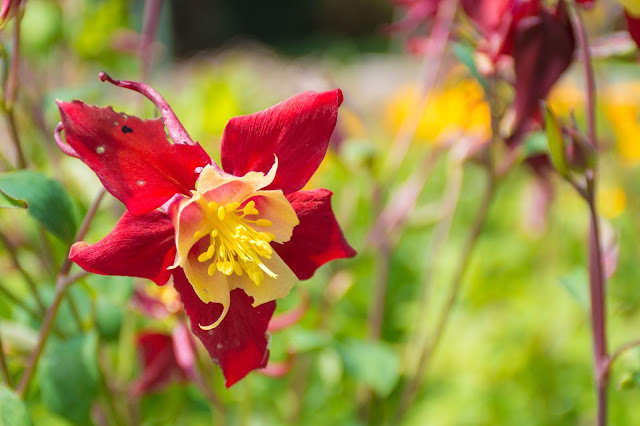 One of my photography projects/goals on my other blog this year is to take a picture of the local Sequoia Gardens once a month to document the seasonal changes. 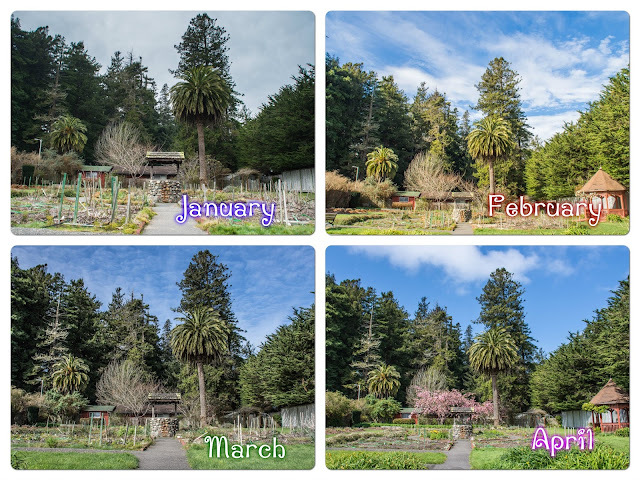 Above are January through April. As you can see, in April, the beautiful weeping Japanese Cherry Tree started to bloom, really adding color to the gardens! I like to think Dory had a bit of influence to make this happen! 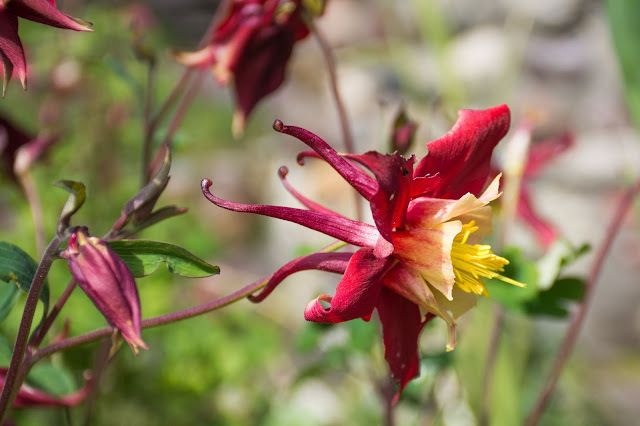 This Columbine has seen better days....and is a bit worse for wear. I can relate and I have to say I feel a lot like it does some days, a bit ragged around the edges. I've been a bit lost blogging lately, trying to find Arty and Jakey's voices while living without having my gal pal and her silly smiley. 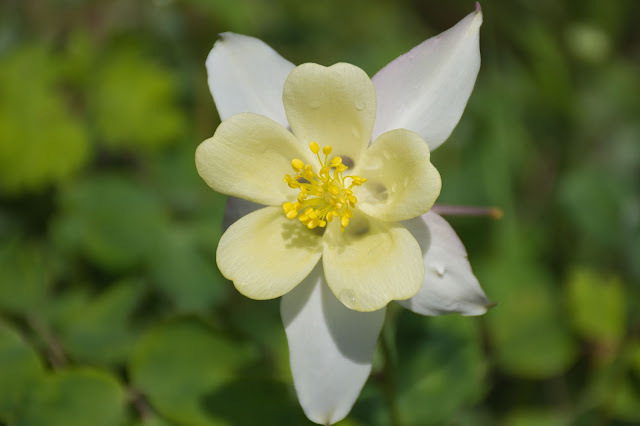 But, like this bright yellow Columbine, I know that I will bloom again...I just need to take some time and regroup. 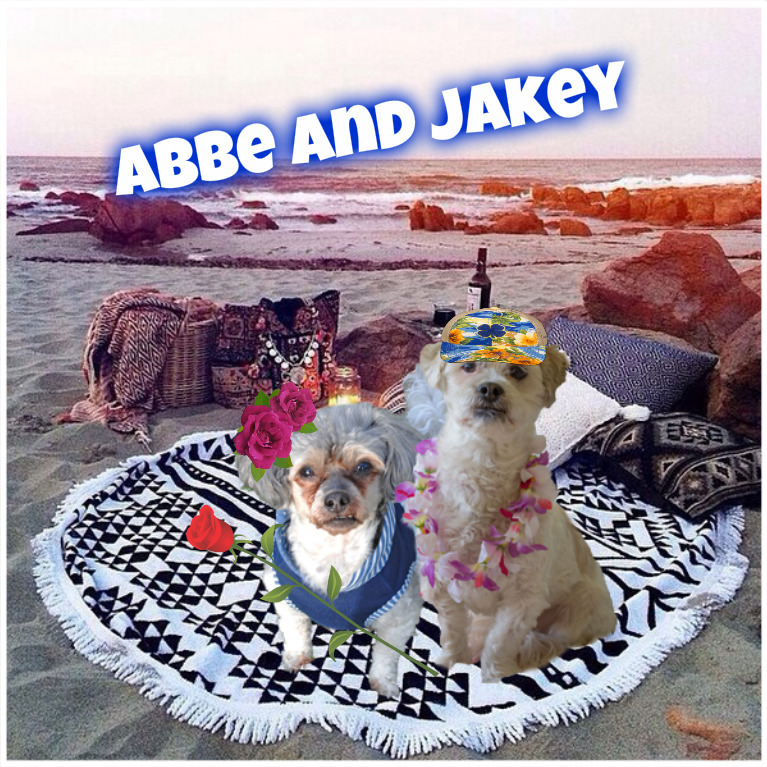 I am looking forward to spending a week with Jakey and Arty(and my hubby) and sharing a fun adventure with them. 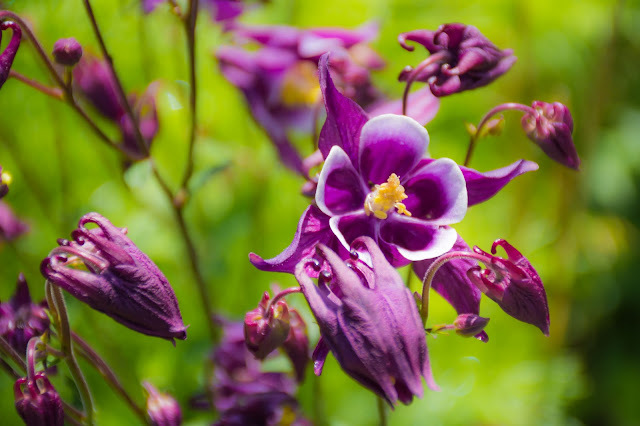 Like this first purple columbine blossom, we are starting with one thing at a time. For now, you will probably notice our Blogger Signature has changed to Da DB Boys(DB short for Dory's Backard). I'm still working on our Wordpress and Disqus signatures, but they should be changed over soon. 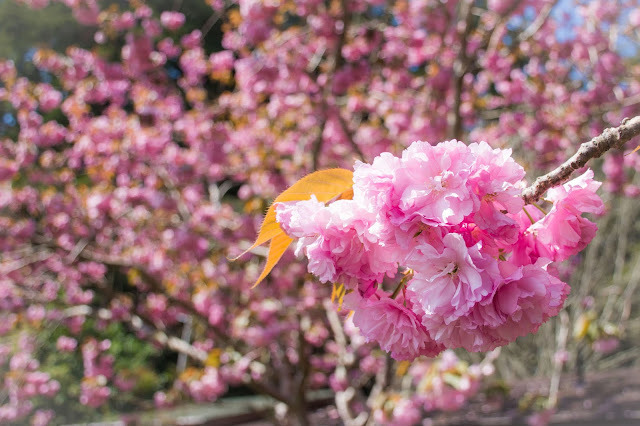 Dory will still live in our hearts and shower her angel love like the petals of this Japanese Cherry Tree and, as I update our About Us page, I will be adding a Tribute Page for our sweet girl. Hmmmmm, help??? 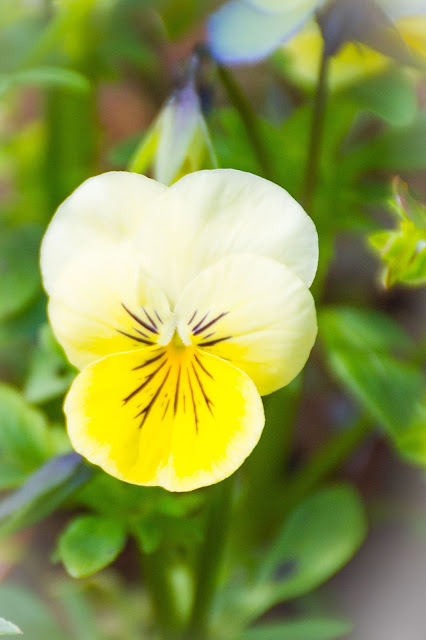 Yellow violet or yellow pansy...??? 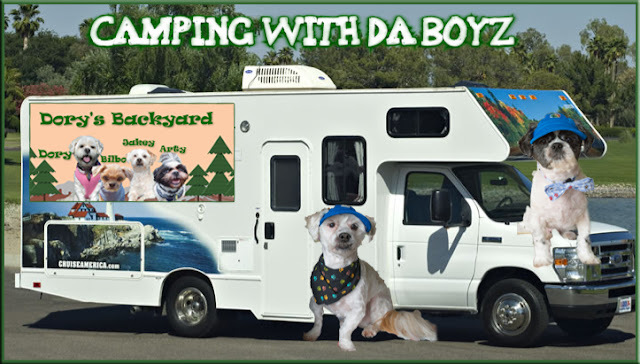 In the next month, Dory's Backyard will transform into Da DB Boyz as Arty and Jakey find their voices(with Bilbo to add his two cents). I want to thank all of you for helping me through the past three weeks. Keeping focused on Spring Break and Blogville has helped me more than you will every know. 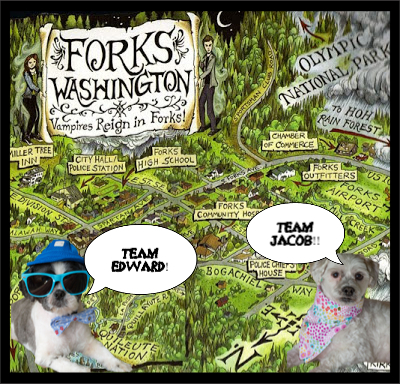 Although we have a Saturday and Sunday post coming up, The Hubby, Boyz(Arty and Jakey) and I will be adventuring the wilds of Washington while Bilbo is showered with tons of love by Nanny Ally. 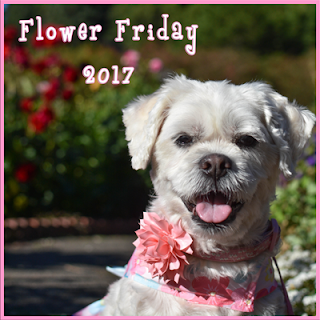 Jakey wants to assure everyone that he will be here next Friday to host the next Spring Installment of Flower Friday!! and going camping for the first time EVER!! 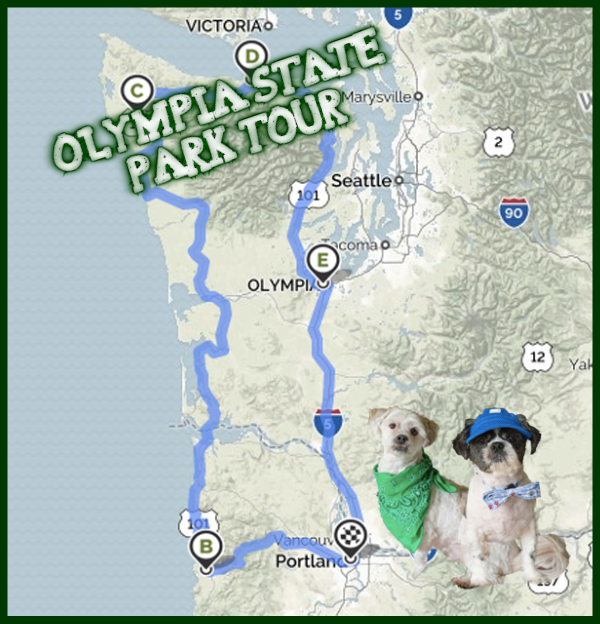 We will be renting a wheelie house and doing a loop around Olympia Park! 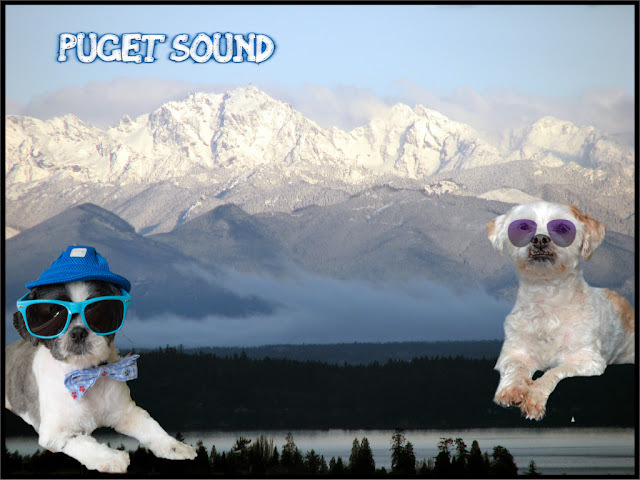 Then we will be relaxing and communing with nature up by Puget Sound!! 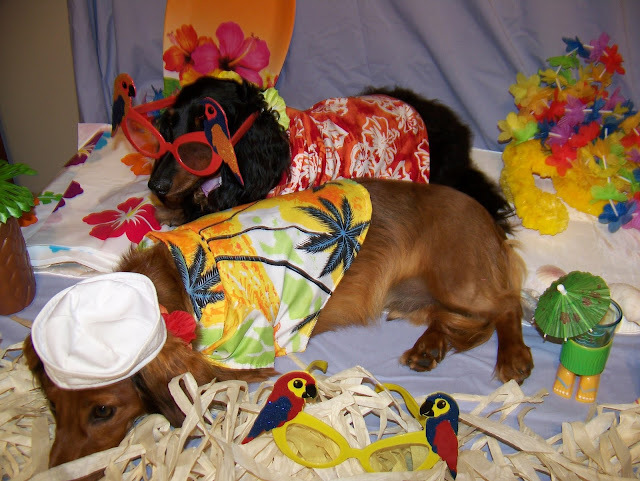 We'll make sure Mama takes lots and lots of pictures and we'll tell you all about it when we get back!! 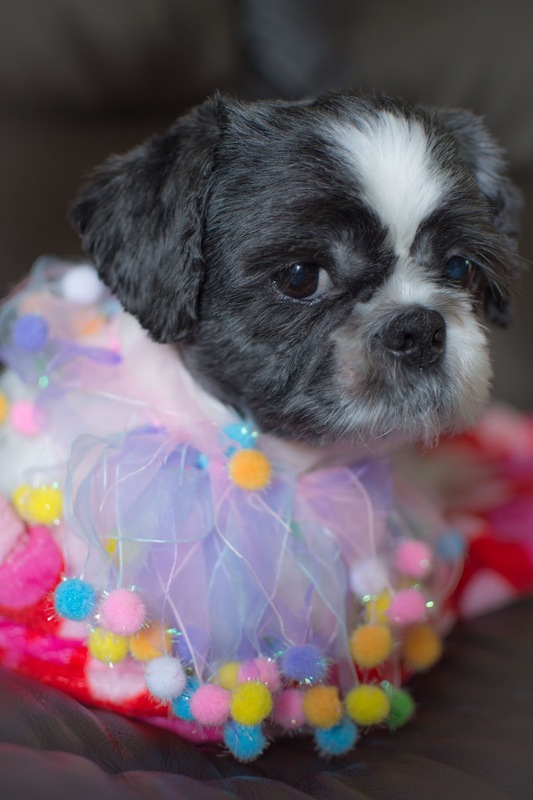 Why yes, I do feel pretty!! 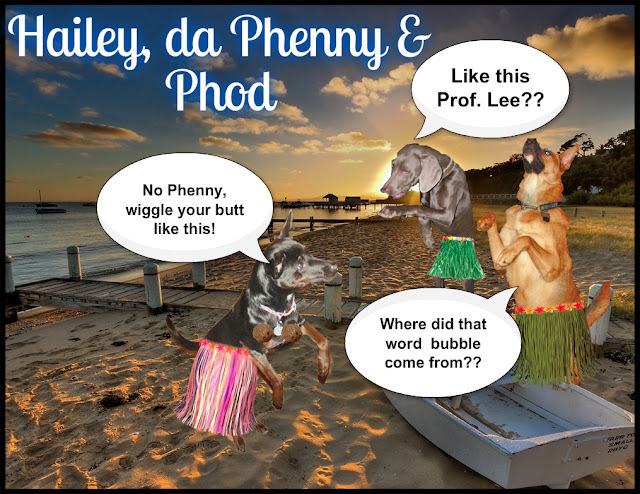 I can't believe it, we just got back from Spring Break and it's time to turn around and head back out on another adventure!!! 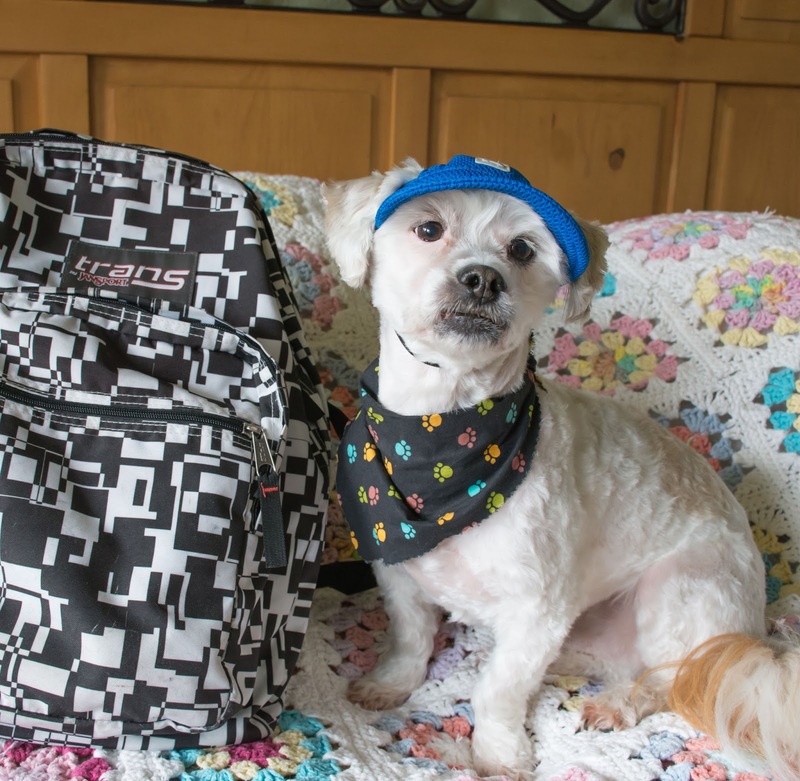 That's right Arty, this Saturday we are hitting the road with Mama and Daddy! Come On Mama...time to get packing!!! 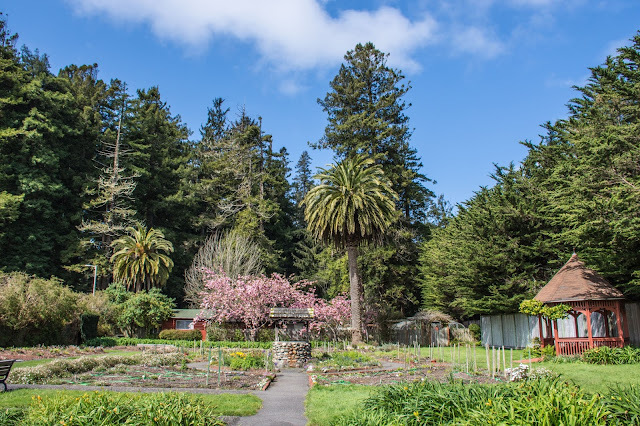 Read more about our trip this Thursday!! As our the 2017 Blogville Spring Break winds down, we gather for some sunset Hula Dancing! 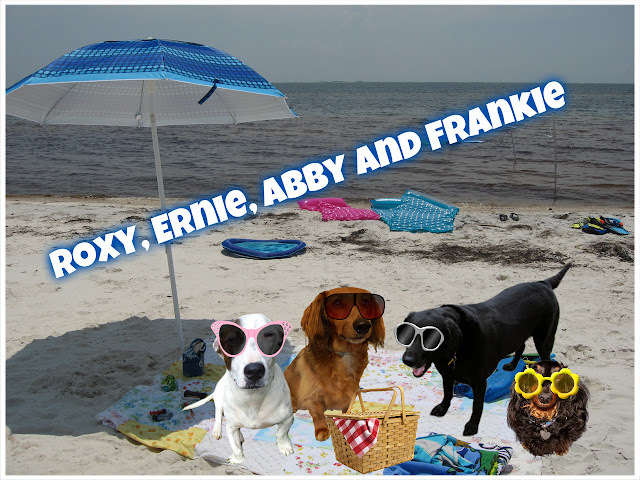 Frankie and Ernie are helping Abby by keeping the Buffet table clean! 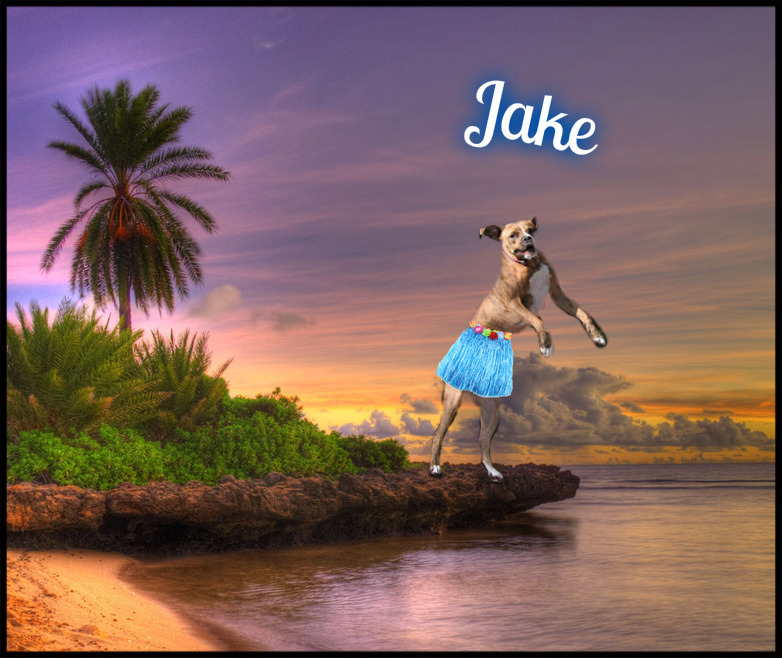 Jake must have been a Native King in a past life...he is a natural! 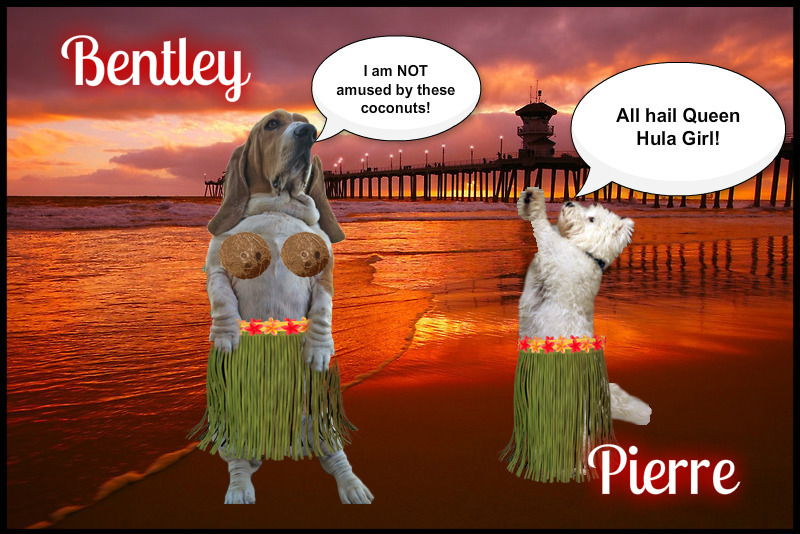 Hailey is a natural born teacher, teaching Phenny the art of Hula!! 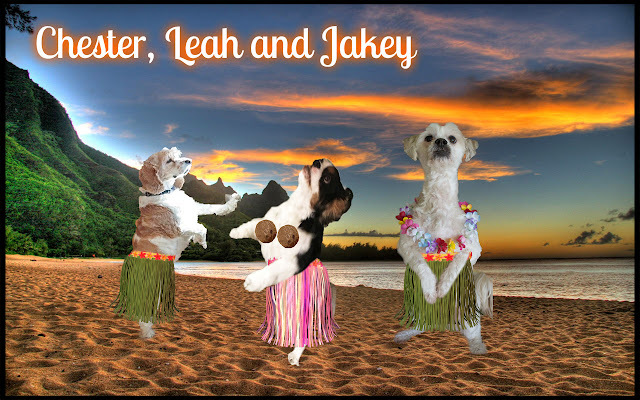 These three seem to have a handle on how to tell a hula story! 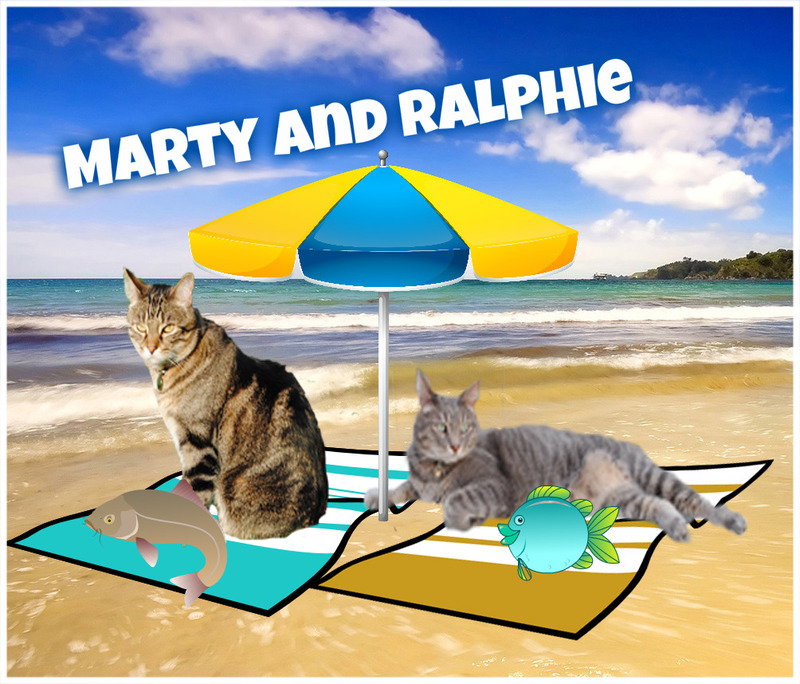 Oh My...Looks like Ernie and Frankie might have moved over to Ruby's Margarita truck...looks like they may have had one Rubyrita too many! 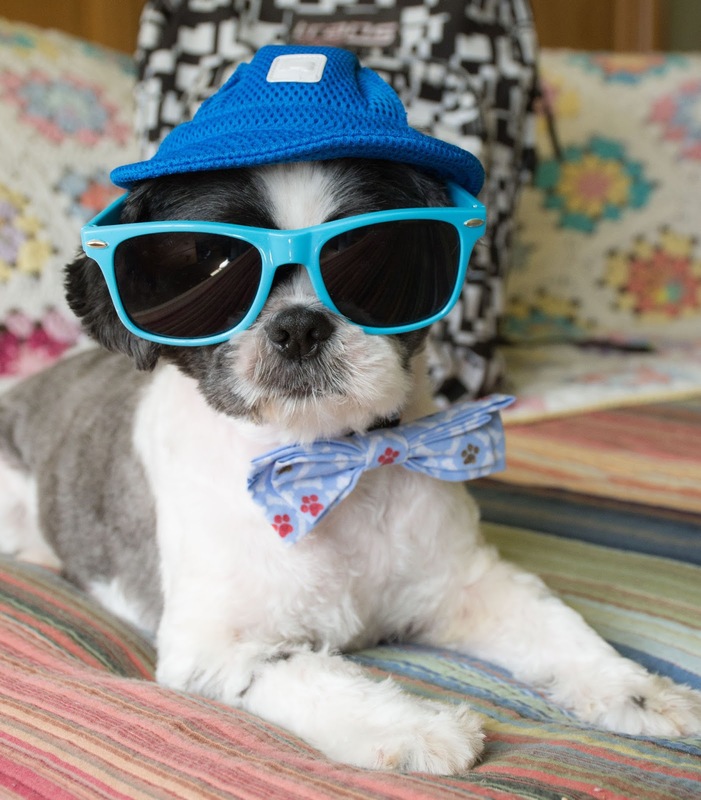 Sweet William knows how to move to the beat thanks to his DJ Alter Ego! So sorry Bentley....Mama may have been a bit punchy when this happened...BOL! 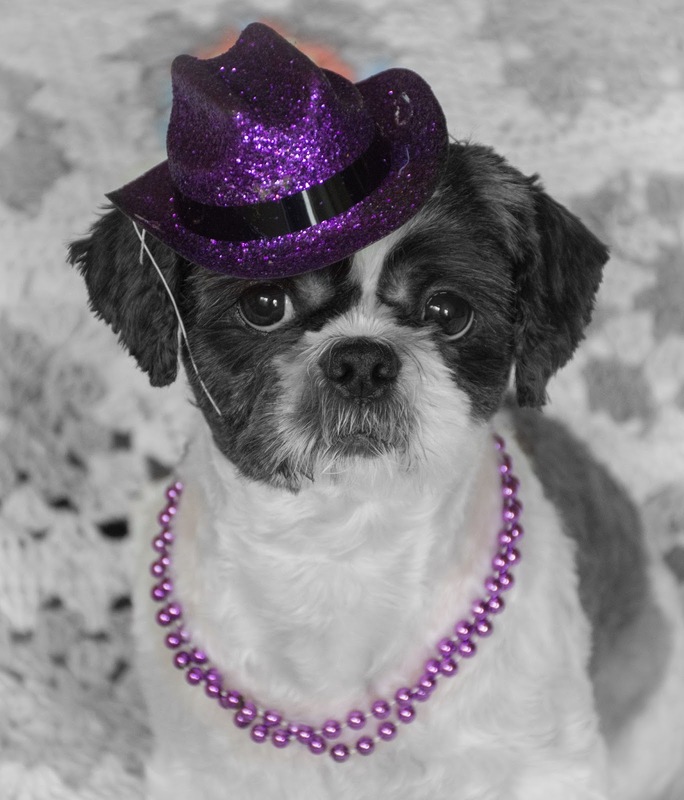 ...and Dougie Dog over at Zoolatry is also in his own little world. Maybe we should get these two dreamers together! 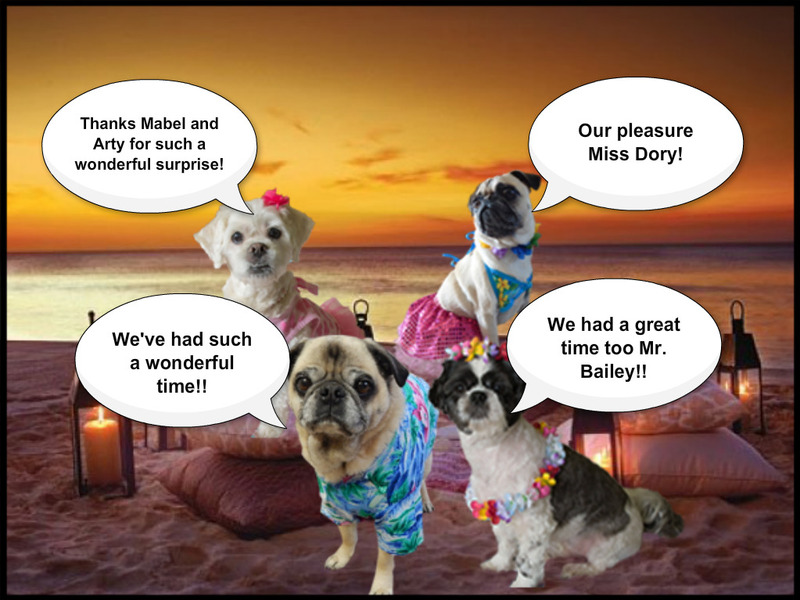 Mabel and Arty are enjoying some hula alone time! 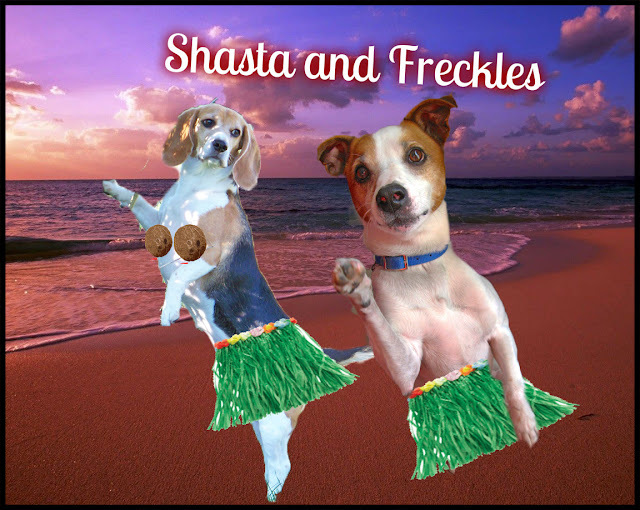 Even though they just met, Freckles and Lady Shasta look like they have been dancing together forever! 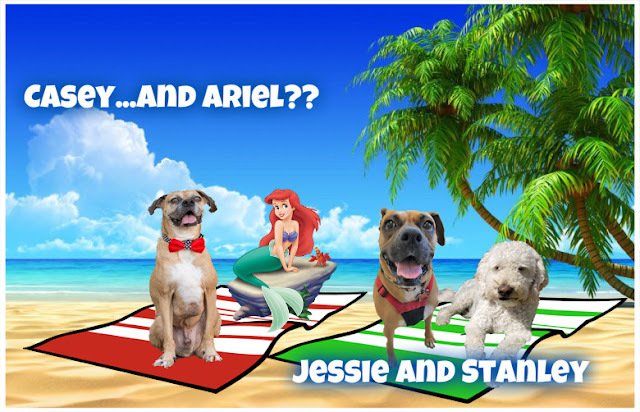 Looks like Jessie and Stanley might just almost got that alone time they were hoping for....Ariel must have had to go back into the sea...sorry you two! Thank you so much for joining us for this memorable day. We hope you enjoyed it as much as we did!! Make sure to check out all of these cool Spring Break events!! 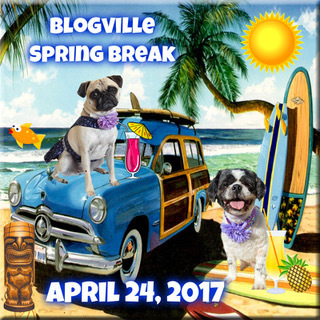 Follow along with our 2017 Blogville Spring Break Blog Hop! Feel free to hop aboard and show us what you are up to during Spring Break! 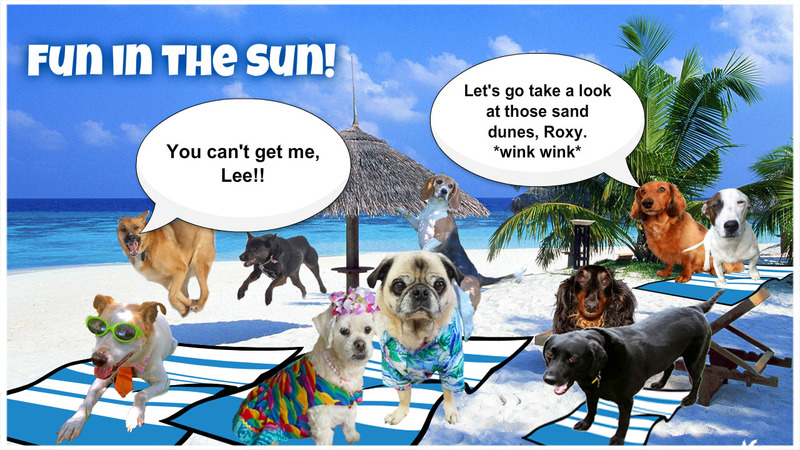 We've made it down to the beach and now it's time to have some FUN!! 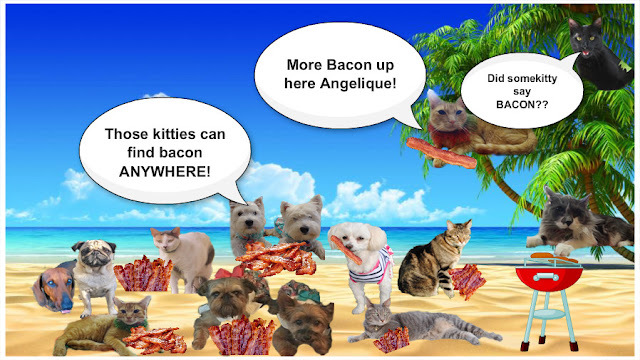 The Lone Star Cats must have brought their BBQ down and are having a bacon fry for some of their fur-iends! are enjoying some much needed down time! 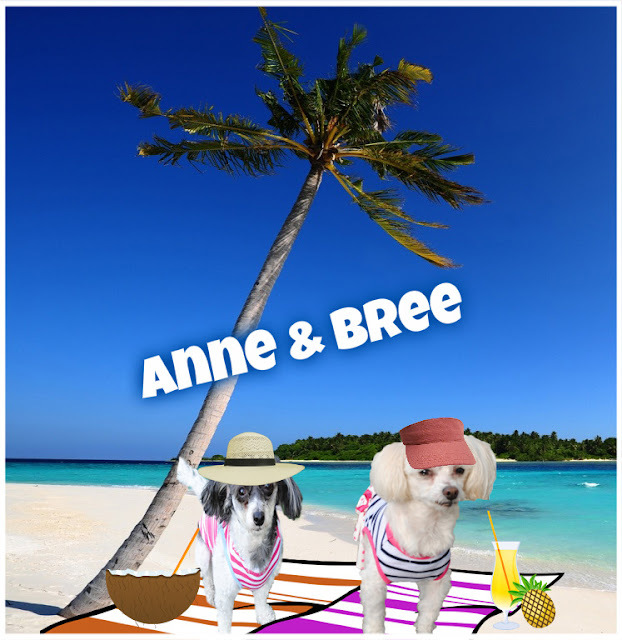 Marty the Manx''s Woofie sisters, Anne and Bree are catching some rays! is ready to pawty in style! 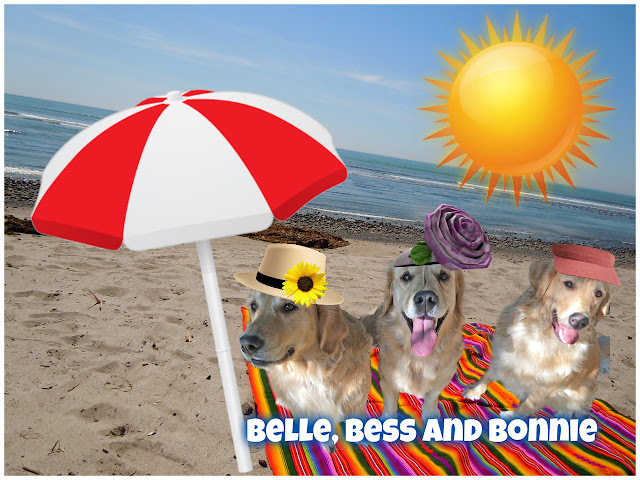 Belle, Besse and Bonnie from Three Pups and a Couple of Kitties are all dressed up and ready for a bright and sunshiny day! 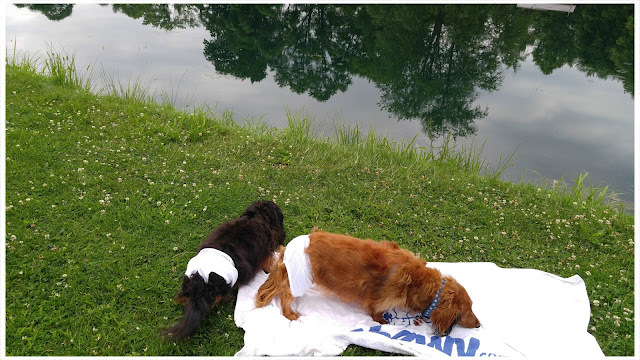 Mr. Bailey and Dory are enjoying a beautiful spread from Abby's Food Truck!! 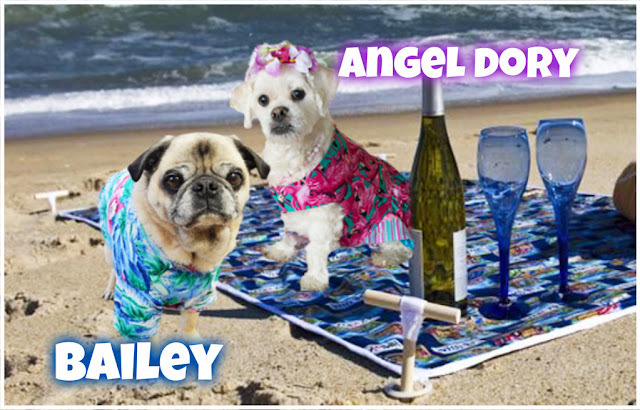 Make sure to stop by her place later today for some scrump-dilly-umpcious beach snacks!! Click HERE to transport over! ERNIE...I am TRYING to get our blanket ready for our wimmens...get OFF!! Wow, has Casey found a new friend??!! 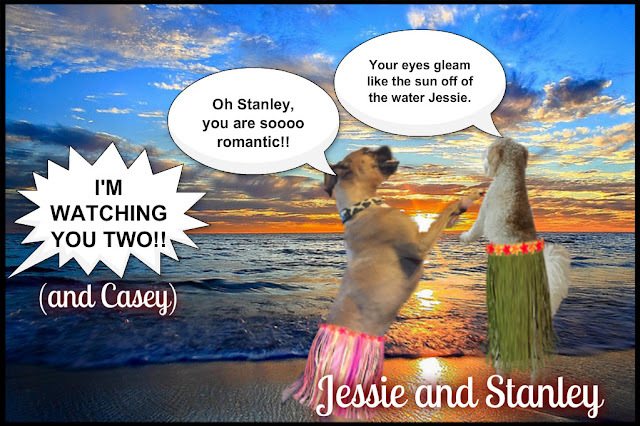 Maybe Jessie can get some "alone time" with Stanley today! 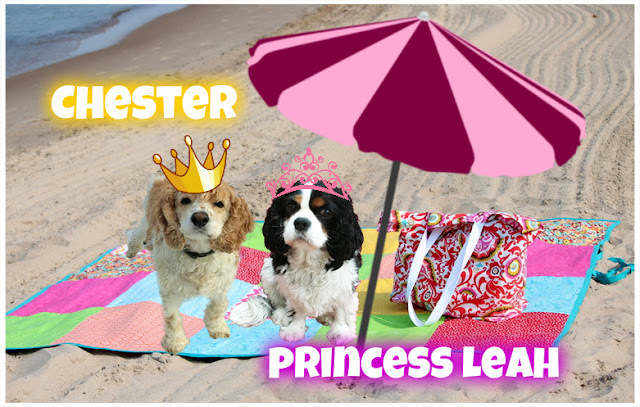 Princess Leah and Chester, from The Daily Bone have found a royal way to enjoy the beach! 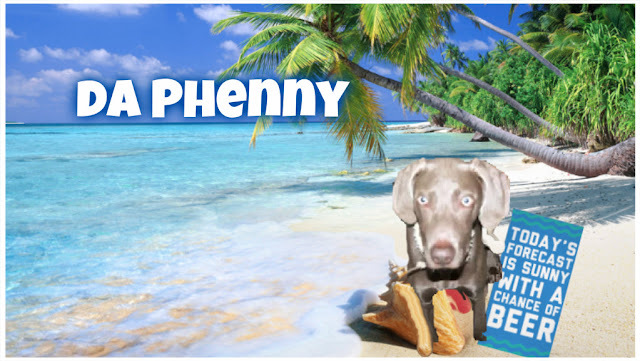 Keep hoping da Phenny, you aren't quite old enough to drink yet!! 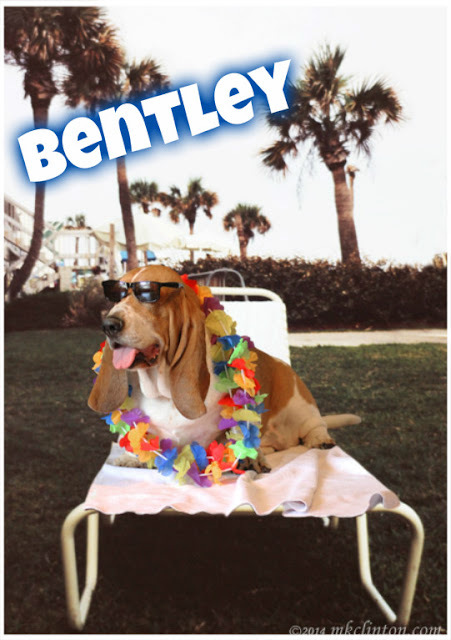 Wait...even better, it's Bentley, one of the famous Co-Anchors of the BFTB News!! 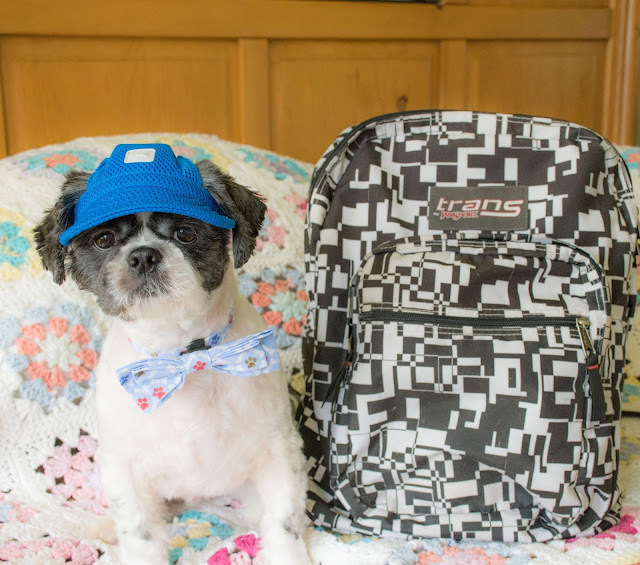 Make sure to head over and read today's news report! 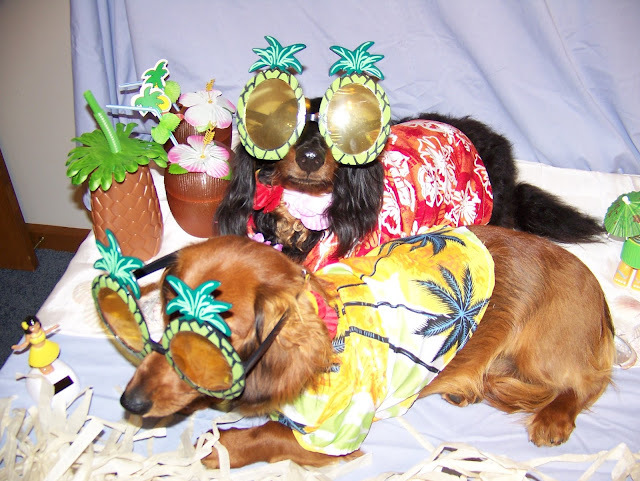 Look at these cool pups!! Looks like Jakey is planing a romantic afternoon for Abbe! Lightning and Misty over at the Chronicle of the Woos are setting up their corner of the beach. 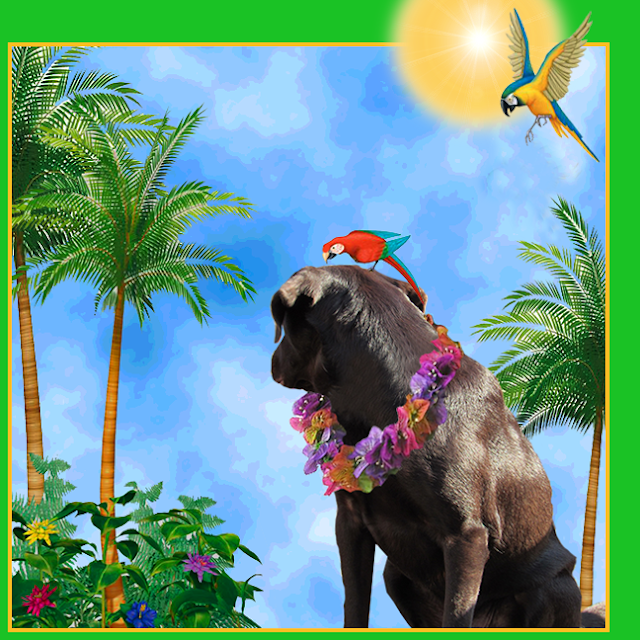 Is there a squirrel in that umbrella, Misty?? 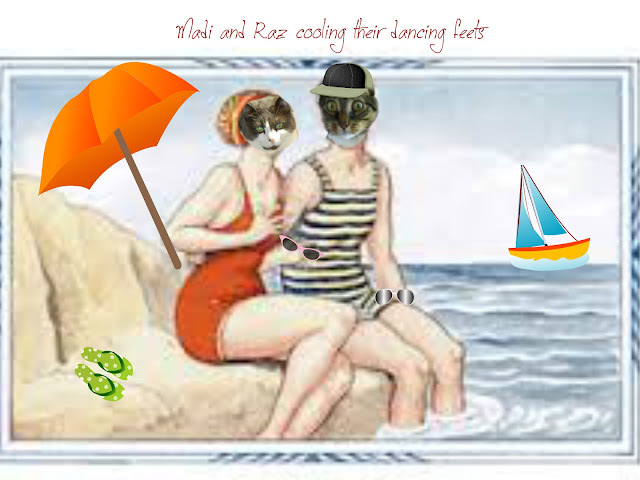 Madi and her guy Raz are cooling their pawsies in the ocean...and looking very cozy! 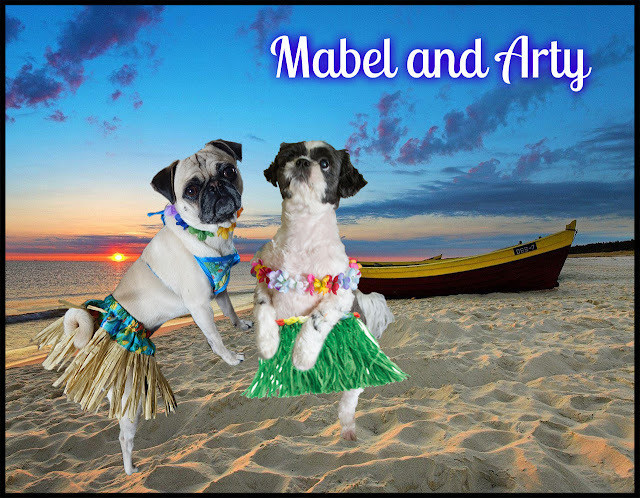 Bertie and Addi sure know how to make an entrance! 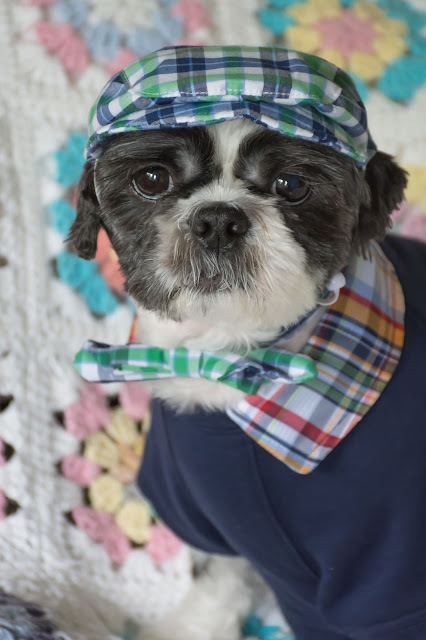 Pierre made sure to wear his raingear in case he splashes down in the ocean when it's his turn! 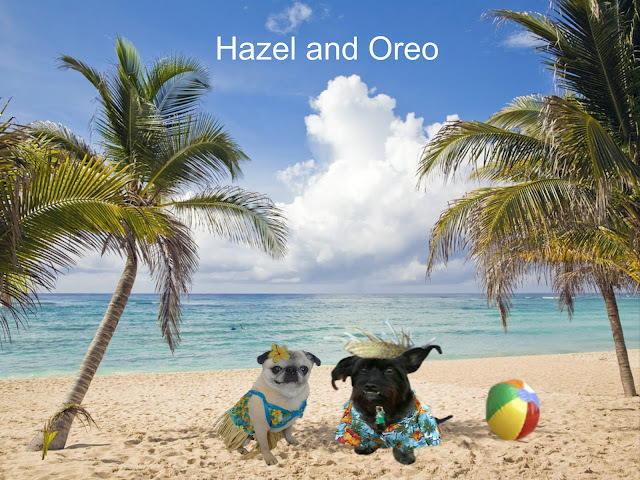 Hazel and Oreo take a break from their game of ball to make goo-goo eyes at each other! 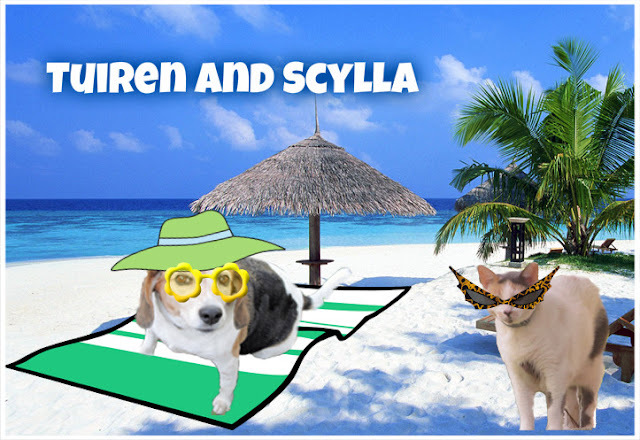 Tuiren and Scylla from ATCAD catching some late afternoon rays! Looks like there are mixed feelings about getting in the water! 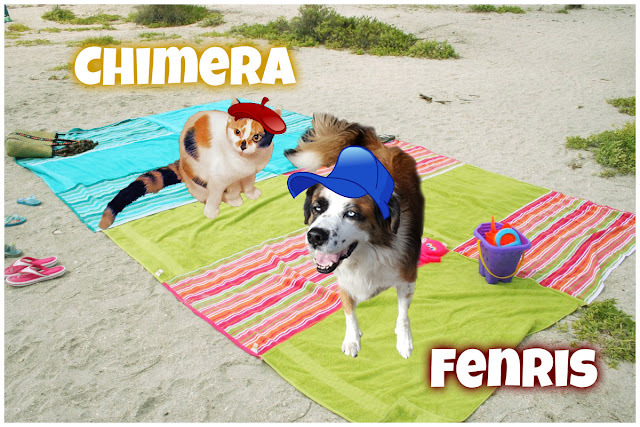 Murphy and Anne are having blast, while Madi and Chimera hang out on the umbrella as far away from the water as they can get!! 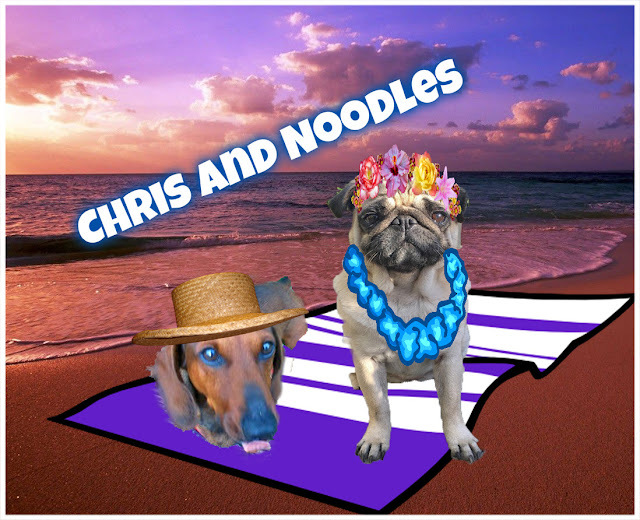 Chris from Paw Provice and his gal Noodles enjoying a beautiful sunset! 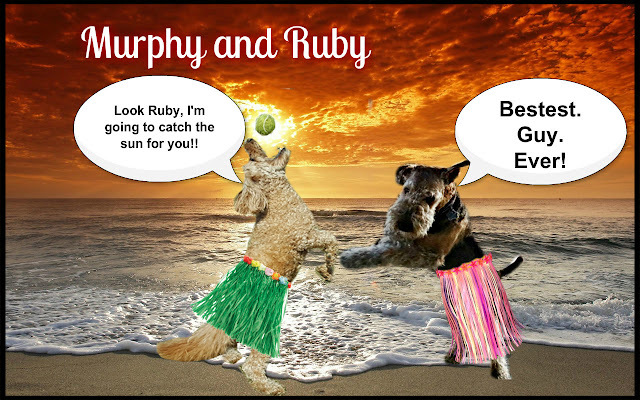 Speaking of sunset, we're going to take a break while we change into our Hula skirts! 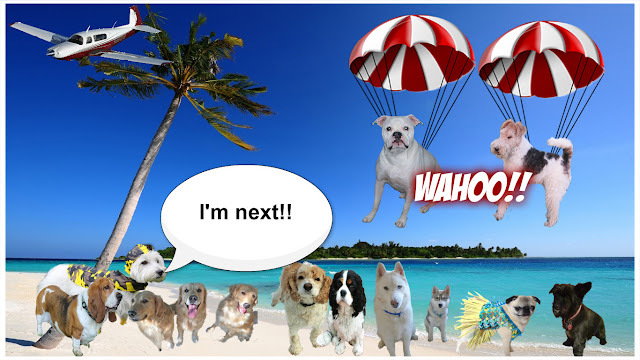 Stay tuned and we'll be back!! On Our Way to 2017 Blogville Spring Break! April Birthdays and some Jakey Fun!